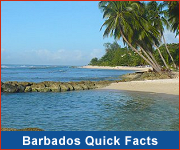 Barbados weather is generally warm and sunny all year round with an average daytime high of 30°C / 86°F. In fact, Barbados has over 3,000 hours of sunshine each year! 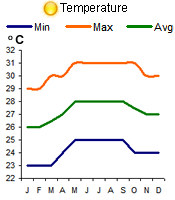 The prevailing northeast tradewinds blow steadily so that although it is bright and sunny, it is not unbearably hot. The nights are usually slightly cooler. The rain typically comes in quick showers. The dry season lasts from January to June. Whether the rain falls or sun shines, there is always fun day or night to be had on the Jolly Roger pirate ship. 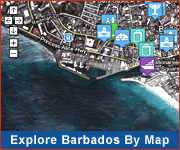 Explore Barbados with a range of well-maintained vehicles. Whether you cruise in luxury, or prefer a versatile SUV, Voyager Rent A Car provides the perfect island experience. With excellent weather year-round, it's always a great time to visit Barbados. 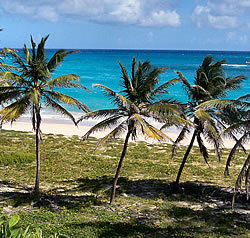 Barbados weather is mostly sunny and fair with warm days, cool winds and cozy nights. We are in the tropics, and believe it or not, some locals actually put on a sweater in the cool night winter time breezes. Barbadians complain that the sea is cold when it's 78oF !!! It rains mostly in summer and a good rainfall is refreshing and much needed. 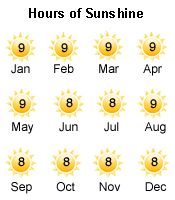 Rain is usually followed quickly by sunny skies and within minutes everything will be dry. Tropical rainstorms sometimes occur in the hurricane season which runs from June to October (as we say in Barbados - "June too soon, October all over!"). 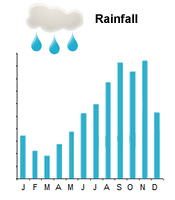 Tropical rains are spectacular but the island is very porous and the heaviest rains quickly drain off into the underground lakes or the sea. Hurricanes usually avoid Barbados. They arise off the African Coast and head to the Caribbean, swinging North about 100 miles from Barbados. The pattern is reasonably consistent as hurricanes tend to bounce from one land mass to the next and Barbados is somewhat separate from the Caribbean island chain. This does not of course make us immune, but the last occasion which Barbados suffered a direct hit from a major hurricane was in 1955. There is a story of a bus driver who drove his passengers straight through the worst of Barbados' hurricanes, "was a bit of a breeze" he is supposed to have said. Other major recorded hurricanes to hit the island occurred in 1898 and 1831.